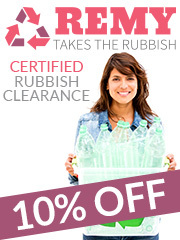 Searching for a Trustworthy Rubbish Clearance Firm in London? Hire us and our highly trained and efficient rubbish collectors will come to your property in the shortest possible time, fully-equipped and ready to accommodate all your rubbish removal requirements. London Remy Takes The Rubbish has a reputation for being the most dependable rubbish removal company in town because we deliver a variety of rubbish clearance services at low prices and always go above and beyond when helping you get rid of rubbish in London. In need of high quality rubbish disposal services for your domestic property or business premises in London? All the experts of our London Remy Takes The Rubbish are committed to delivering top-notch waste collection services to the residential and business clients we work with. We provide great quality and incredible value waste disposal services to all household and business owners in London. If you need more information about our professional services or prices, get in touch with our knowledgeable team on ‎020 3409 3214 in London at any time or contact us via email.